Satan the devil is very clever. No wonder. Before he became the devil, he was a resplendent spiritual being — an archangel. At that time he was "full of wisdom" (Ezekiel 28:12). When Satan rebelled against God's government, however, all of that wisdom became perverted (verse 17). It became tricky and deceitful. That is one of the reasons he has been able to fool all humanity (Revelation 12:9). He has deceived the whole world, as the Bible clearly states. When you think about it, that is no small accomplishment. You've heard the saying: "You can fool all of the people some of the time, and some of the people all of the time, but you can't fool all of the people all of the time." But don't you believe it – Satan has done it. Starting with Eve and, through her, Adam, Satan has fooled all humanity in every generation. How does he do this? He doesn't appear personally to every individual and lie to each one, as he did to Eve. He doesn't have to. He has a more effective method. It wasn't long after the development of radio broadcasting that the governments of various nations discovered what a powerful tool radio could be to spread propaganda — to influence, confuse, even deceive their own or enemy populations. Radio, and now television, too, have at times been used effectively to that end. The airwaves have been used, especially in wartime, to promulgate blatant lies, as well as what is labeled "disinformation." Disinformation is a sort of mixture of truth and error — enough truth to make it sound authentic, but enough error to render the whole misleading and deceptive. Satan long ago realized the potential of media propaganda. He is the father of the lie (John 8:44), the first and most effective minister of propaganda ever. In the same way broadcasting has at times been misused by human propagandists, Satan "broadcasts" his deceptive message. He is the "prince of the power of the air" (Ephesians 2:2). He emits an attitude of rebellion. He radiates a spirit of defiance, of disobedience. Some of his message consists of outright lies; some of it is disinformation – a mixture of truth and deceit. But the thrust of his message is always the same: Do not totally submit to the government of God! When Satan was still a righteous archangel, God made him ruler of this earth. But that position did not satisfy him. He wanted more. He became driven by vanity and greed. He wanted control over everything, not just this earth. His desire was to be like God (Isaiah 14:12-14, Ezekiel 28:12-15). So Lucifer mounted a rebellion against God's throne in heaven. But he was defeated and cast back down to earth, as were the angels that rebelled with him. Jesus was there and saw it happen. He recalled, "I saw Satan fall like lightning from heaven" (Luke 10:18). Though Satan has fallen, God has not yet removed him from his position of being "the ruler of this world," as Jesus acknowledged him to be (John 14:30). The devil has authority over the kingdoms on earth (Luke 4:5-6). Jesus Himself, at His fast approaching return to this earth, will take the rulership of the world from him. Satan will then be bound, not allowed to deceive the nations for 1,000 years (Revelation 20:3). Until then, his work of deceiving all humanity continues. "Well," some will exclaim, "I can agree that Satan has deceived many people. I'm sure he has the atheists in his camp. And there are certain tribes of people that openly claim to be devil-worshipers. And then there are individuals in every nation who are just plain evil. I'm sure Satan has deceived those people. "But the whole world? Come now, what about all those churches that teach professing Christians that Satan is the wicked one, that he is the enemy of God and man? How can it be said all those people are deceived?" What about that? It is a fact that vast numbers of people simply do what they believe is right. They would never knowingly choose to have anything to do with Satan. Many are, by any of the world's standards, exceptionally "good" people. Can such be deceived? There are sincere theologians who teach against the works of the devil and his demons, some of them eloquently, even going so far as to try casting demons out. Is it possible for such to be deluded by the very devil they preach against? And if you are one of those who have come out of Satan's world, spiritually speaking, as all true Christians have, does that mean you are now immune to being misled by Satan's' evil influence? It is vital that we understand, that we not be "ignorant of his devices," lest he get the advantage over us (II Corinthians 2:11). Here is one of Satan's most important devices. Here is something the devil for sure does not want you to know. Satan is a compromiser. He is flexible. He will bend. He will engage in give and take as long as — and this is the ultra important point — as long as he gets his way in the end. That is to say, as long as those he is dealing with stop short of fully submitting to God's government. The Bible clearly states, as we have seen, that Satan has deceived the whole world (Revelation 12:9). How has he accomplished this? By compromising. The devil has something for everybody. The broad highway leading to destruction – the highway humanity is following — is broader than perhaps you realized. It is divided into innumerable lanes. Everybody is sure to find at least one of these lanes appealing. But they all lead to the same destination: perdition. If the devil had his preference, he no doubt would want everybody to be God-hating, atheistic anarchists bent only on doing evil. But he hasn't succeeded in bringing about such a condition. True, there are a few individuals in the world who are like that. But most are not. There are devil worshipers. They, too, are small in number. But they do exist. There are those who deny Satan is real and those who have no opinion in the matter. Satan doesn't really care, though. As long as they don't obey God. You've seen the pictures of Satan as a funny-looking, red-faced personality with a goatee, little horns growing out of the top of his head and a long, pointed tail. He is portrayed cavorting amidst flame and smoke, brandishing his pitchfork and emitting gleefully evil peals of laughter. This concept is accurate to some, ridiculous to others. Satan doesn't care either way. If people want to poke fun at the devil, to think of him as a superstition, a fable, it makes no difference to him, as long as he has them going his direction. Do you know that, if he must, Satan is even willing to allow you to obey many of God's laws? As long as there is at least one point of the law — whichever one it may be for you — that you refuse to keep! The reason is that Satan knows God has ordained that to break one point of His law of love is to break it all (James 2:10-11). Therefore, to refuse to submit to one point is to rebel against God's entire divine code of behavior. Anyone guilty of such an attitude of rebellion obviously is not totally submitted to God. That's good enough for Satan. There are those in the world who may preach powerfully against Satan and his evil works. They may condemn his ways as corrupt. They may accurately show how he gets to people through much of today's music and entertainment. They may say to resist the devil. They may even urge acceptance of Jesus Christ as personal Savior. Believe it or not, all this, too, can fit into the parameters of Satan's scheme. How? It can be possible if church denominations, however eloquent the sermons may be, stop short of teaching that we must obey all of God's holy laws — if, instead, they say God's laws have been done away with, that they are no longer binding upon Christians. Listen to what Jesus taught! He declared: "Do not think that I came to destroy the Law or the Prophets. I did not come to destroy but to fulfill" (Matthew 5:17). Yes, Jesus showed how to fulfill God's royal law. In this He set Christians an example that they are to follow, because they also are expected to fulfill the law (James 2:8-12). It is a question of law — of government, of obedience to God's way of life as revealed in His Word – and don't ever let anyone tell you any differently. Total submission to God's law is what makes the difference between Satan's broad, all encompassing, something-for-everybody way to destruction and God's narrow way that leads to life (verses 13-14). But the devil doesn't want you to know that. He wants you to think that what makes the difference is whether or not a church "preaches Christ" and believes Christ is the Savior. He doesn't want you to know you can believe Jesus Christ is the Savior, even worship Him, all in vain (Matthew 7:21-23, Mark 7:7)! Satan is an expert in making evil look good. By compromising he can take something that is evil and combine it with enough good to make it look perfectly innocent. His strategy is to use disguise (Matthew 7:15). He made Eve believe that the innocent-looking but forbidden fruit was good for her (Genesis 3:1-6). When he tried to get Jesus to disobey God, he quoted good, valid scriptures (Matthew 4:6). But beware: A glass of good water with a few drops of cyanide in it still looks like an innocent, perfectly good glass of water. Satan is deceitful. Your only hope of not being fooled by him is to study and believe God's Word and obey God's laws. You need to ask for God's Holy Spirit to give you light and understanding. Do what Satan doesn't want you to do: Surrender to God. Then "resist the devil and he will flee from you" (James 4:7). That's how to get rid of Satan's influence in your life. That's how to come to the place where you can make the same victorious statement Jesus made when He declared concerning the devil, "He has nothing in Me" (John 14:30)! For more information on this powerful and supremely evil being known as Satan the devil, read our free booklet Did God Create a Devil? 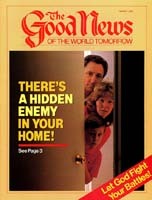 It contains much more that Satan definitely doesn't want you to know!